ACAL’s mission is to promote adult literacy and numeracy policy and practice. 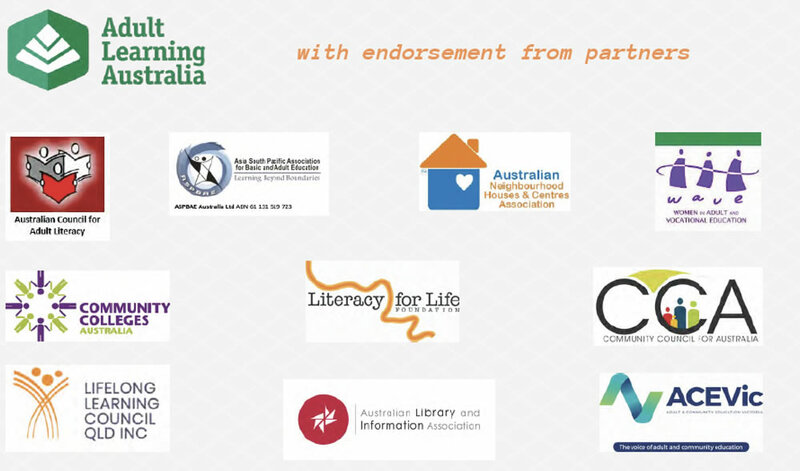 In advocating with ALA, ACAL is pleased to support the provision of adult LN in the Adult Community Education sector and recognises the role it plays as one of the many spaces in which adult literacy and numeracy needs are met. ACAL also advocates for a strong TAFE sector and private sector to provide robust coverage across Australia and as many LN opportunities for adult learners as possible. This joint statement has just been issued. We believe that all Australians must have access to the benefits of lifelong learning as a means to a more just and equitable Australia. We are calling for a federal government commitment to a national lifelong learning policy that outlines economic and social goals; integrates equity and efficiency, and defines roles and responsibilities for community, business and all levels of government. The national lifelong learning policy must include an adult literacy strategy that prioritises language, literacy, numeracy and digital literacy in various contexts, including workplaces. It must also have a strong focus on socially and economically marginalised Australians. A lifelong learning policy would support the government to meet its international commitment to the sustainable development goals and contribute to civil society. We are also calling for a renewed Ministerial Declaration on Adult Community Education (ACE), which recognises the sector as an indispensible component of the post-secondary education system. The federal government must invest in and recognise ACE’s role in attracting and supporting key equity groups; providing pathways to further education, training and employment, and in promoting health, wellbeing and social connection.